This busy young couple contacted Alison Friedricks Interiors four months prior to moving from New York City to Chappaqua. Their new home needed renovation, particularly the kitchen, family room and children’s rooms. We defined the scope and budget of this contemporary interior design project, chose a color scheme and designed floor plans to accommodate their existing furniture. 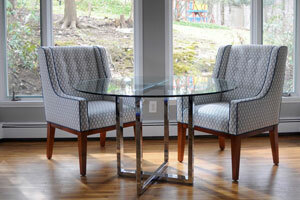 We consulted on and coordinated the purchase of new pieces.